To create home-made Geodes of varying colors! Geodes are spherical-like stones with crystals in the middle. Sometimes the crystals inside the stones can be of beautiful and varying colors. The colors are a result of different minerals that are inside the rock. There is no telling what colors are inside a geode until it's broken open, leaving an allure of mystery behind everyone that's found. Geodes made up entirely of solid crystals all the way through are known as nodules. Many geodes and nodules can be found at local museums throughout the country. You can even visit the world's largest geode known as The Crystal Cave located in Put-in-Bay, Ohio, a small town on South Bass Island in Lake Erie. Only about 10 minutes to set-up and several days for the geodes to form. 1. We'll need only the egg shells, halved, for this experiment. You can either crack the eggs in the middle and discard the contents or you can try using a knife to cut a more precise line in the middle. Either way, the egg contents need to be removed so you're left with two even halves of egg shell. 2. Rinse the eggshells clean, being careful not to break the shells or crack the bottoms. Set aside to dry. 3. Pour two cups of warm water into a large glass. 4. Spoon Epsom salts into the glass of warm water, mixing as you go, until no more salt can dissolve. 5. Be creative and add whatever food coloring you like to the Epsom salt solution. 6. Pour the colored Epsom salt solution into each eggshell halve. 7. Set the eggshells with the solution in a cool dry place. You'll need to wait for the water to evaporate and the Epsom salts to crystallize. This could take several days, so patience is required. 8. When the water has finally evaporated, you have made your very own colorful and unique Geodes! Note: The eggshells don't need to be perfectly straight-lined. Cracking them is often easier than trying to cut them. The next time you or a parent makes eggs for breakfast, make sure to keep the shells for your next batch of home-made Geodes! Observation: What could you add to the solution to make natural mineral colors (in place of the food coloring)? How long do you suppose it would take a real geode to form? Result: Real geodes are formed in gas bubbles in igneous rocks, such as vesicles in basaltic lavas. Our egg shells act as the rock surrounding the cavity of our geodes. As the water from the solution evaporates over time, crystals from the salt minerals are formed inside the hollow chambers of the eggs. 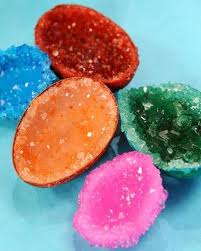 The food coloring mimics some of the colors that may form inside real geodes as a result of various mineral deposits, such as clear quartz or purple amethyst.